Bridesmaid Dresses With Sleeves: Coverage Can Be Oh-So Chic! As summer begins to wind down – though that might be wishful thinking on my part – 2017 trends are beginning to gain traction. 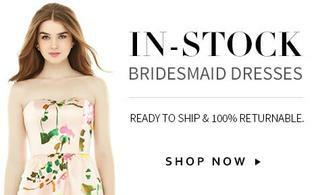 One of the major trends coming up in 2017 is bridesmaid dresses with sleeves, a chic and refined style that designers are bringing over into the bridal world as well. Whether you’re planning a summer, spring, fall, or winter wedding, this chic detail will please those who want a little modesty and a super trendy yet sophisticated design. If the thought of sleeves makes you stop in your tracks, read on. Gone are the days when this detail means horrible puffy, large, and just plain ugly lengths of fabric that encase your arms in an uncomfortable way. Whether the frocks you choose have long or short sleeves, the design extra really adds something unexpected and chic to the overall bridal party design. For many trends, there are only so many ways you can change it up. For example, how many ways can you really re-invent the choker necklace? This severely limits your creativity in terms of what spin you put on the trend. However, bridesmaid dresses with sleeves are one of the most versatile style trends out there. The sky is the limit! In this case, the trend encompasses everything from small caps, longer wrist-length options, and everything in between. Go with demure caps to keep your girls cool in warmer months and to create a charming appearance. Take a look at After Six 6697, a super chic and refined gown that is sure to please. The wide V-neck of the frock is balanced by the ruched caps, which provide modesty and coverage, though the open neck ensures your skin and upper body are still on display. The soft chiffon is perfect for this style because it’s so comfortable and forgiving. One of my absolutely favorite examples of the trend is Gather and Gown Sullivan. It has ¾-length arm coverage, a shorter hem, and a straight silhouette – it’s so chic and trendy, your girls will want to wear it to cocktail parties and dinners after the big day. Seriously! When you’re going for a style with longer coverage, the key is finding balance. Unless you’re going for a very dramatic and modest look, I think a shorter skirt to balance out longer arms is an excellent design choice. I love the sweet lace overlay on Gather and Gown Sullivan: it increases the formality of the dress without becoming stuffy, and it’s visually interesting. If lace isn’t your thing, look for other frocks in this style. The high bateau neckline, shift silhouette, ¾-length arms, and cheeky hem are all trendy elements you girls will adore! 2. Twist on the traditional. When you looked at the above two examples, what was the first word that popped into your head? I’m guessing it wasn’t “matronly” or “stuffy.” While bridesmaid dresses with sleeves might not have been the best choice in the past – hello, huge shoulders and tight necklines of the ‘70s and ‘80s – the 2017 fad has breathed new life into the style. Sleeves – whether they are short or long – don’t have to be horrible and uptight. With the fad, many designers are taking care to create options that are subtle and chic; instead of detracting from the overall look, they add! 3. Complements almost all silhouettes. Another thing I love about this craze is that it works with so many different silhouettes. It’s not like others when it only works for a very specific aesthetic. This goes back to versatility, but it deserves to be mentioned again. If you’re looking for frocks that are on-trend but with some variety, this is the style to go for. For a classic and chic bridal party, check out Bill Levkoff 1138 and other gowns like it. The sheer and small caps are a great example of just how subtle – yet comfortable and supportive – sleeves can be. They are also the perfect complement for the sweetheart neckline, and they add a little extra sense of fashion to the flowing A-line silhouette. Gowns like this one are chic, sophisticated, and super elegant. If chiffon isn’t your think, check out Kennedy Blue Colette. The lace fabric is traditional and eye-catching, and the knee-length skirt is balanced by the coverage of the short sleeves. 4. Great for your ‘maids who feel uncomfortable baring all. Not everyone is comfortable with a low-cut or strapless dress. Instead of forcing your girls to wear something they don’t feel comfortable in – who wants to spend the entire wedding worrying about a top falling down? – choosing gowns with arm coverage is a great way to make sure everyone is comfortable. Kennedy Blue Bella is a great example of how modest – yet chic! – the fashion craze can be. The lace bateau neckline and caps provide coverage, while the sweetheart lining of the bodice tastefully shows off the figure. The floor-length chiffon skirt is flowing and comfortable, and the A-line silhouette is universally flattering. It’s a modest design that is anything but matronly. 5. You won’t look back with regret! One of the fears of choosing trendy styles for your big day is that you’ll look back in a couple of years with regret. Put those fears aside, because this is one fad that will actually withstand the test of time. Take Kennedy Blue Harper, for instance. The lace sleeves, slim silhouette, and knee-length skirt are all trendy elements, but look at how chic and sophisticated it is! Super flattering and refined, this dress will make your girls feel their best, and they won’t be embarrassed to have it hanging in their closet five years down the road. Even more distinctive gowns – like Mori Lee 693 – will remain timeless. The lace cap sleeves counter the deep V-neckline, and the flowing A-line skirt is a universally flattering and feminine style. 6. Great for all seasons. Another great thing about this craze is that it literally works for all seasons. Keep your girls cool in the summer months with a knee-length skirt and lace or sheer cap sleeves. For cooler weather, choose lined ¾-length arm coverage or a longer skirt. Or any combination you want! The point here is that just by playing with the fabric and length of the neckline, you can find a gown that will keep your girls comfortable and chic. 7. Different fabrics create different looks. Along the same vein, changing the fabric of the neckline creates drastically different looks. Lace adds an element of drama and tradition, while sheer fabrics create a softer and subtler appearance. Mori Lee 696 shows just how dramatic and glamorous sleeves can be, while Bill Levkoff 973 is a great example of a more informal and easy design. Because there is such a spectrum, you can really create the bridal party look you want and ensure your girls are flattered and comfortable. 8. Looks great on all body types. Unlike other fashion fads, bridesmaid dresses with sleeves look fantastic on literally everyone. It doesn’t matter height, bust size, skin tone, or personal style; all of your friends will love this trend. One of my absolutely favorite styles that work with all body types is the convertible Dessy MJ-Twist 2. Why does it work for everyone? Because you can tie the straps and bodice in nine different ways! Hello, ultimate versatility! You and your girls can decide to tie the gown all the same way, but I really love it when each ‘maid ties it in a way of their own choosing to show off their personality and style. Plus, the Maracaine jersey fabric is extra soft and comfortable. Hopefully, thoughts of stuffy sleeves and unflattering modesty have been banished from your mind. Bridesmaid dresses with sleeves are chic, flattering, and timeless. I firmly believe that this trend is here to stay! Whether you choose a style that is formal or informal, for summer or winter, your girls will thank you for choosing such a comfortable and flattering style. You can’t go wrong with this fabulous fashion fad!